If our estimator is underperforming, how should we move forward? For this section, we’ll work with a simple 1D regression problem. This will help us to easily visualize the data and the model, and the results generalize easily to higher-dimensional datasets. We’ll explore a simple linear regression problem. 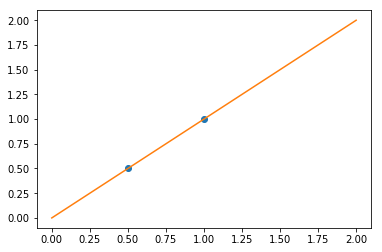 This can be accomplished within scikit-learn with the sklearn.linear_model module. This is a typical example of bias/variance tradeof: non-regularized estimator are not biased, but they can display a lot of bias. Highly-regularized models have little variance, but high bias. This bias is not necessarily a bad thing: it practice what matters is choosing the tradeoff between bias and variance that leads to the best prediction performance. For a specific dataset there is a sweet spot corresponding to the highest complexity that the data can support, depending on the amount of noise and of observations available. One way to address this issue is to use what are often called Learning Curves. Given a particular dataset and a model we’d like to fit (e.g. a polynomial), we’d like to tune our value of the hyperparameter d to give us the best fit. We’ll imagine we have a simple regression problem: given the size of a house, we’d like to predict how much it’s worth. We’ll fit it with our polynomial regression model. In the middle, for d = 2, we have found a good mid-point. It fits the data fairly well, and does not suffer from the bias and variance problems seen in the figures on either side. 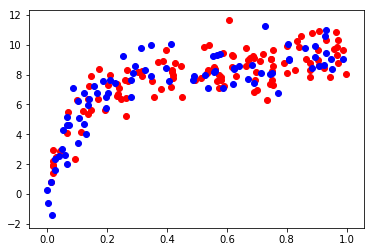 What we would like is a way to quantitatively identify bias and variance, and optimize the metaparameters (in this case, the polynomial degree d) in order to determine the best algorithm. This can be done through a process called validation. # split into training, validation, and testing sets. In order to quantify the effects of bias and variance and construct the best possible estimator, we will split our training data into a training set and a validation set. As a general rule, the training set should be about 60% of the samples. The overarching idea is as follows. The model parameters (in our case, the coefficients of the polynomials) are learned using the training set as above. The error is evaluated on the validation set, and the meta-parameters (in our case, the degree of the polynomial) are adjusted so that this validation error is minimized. Finally, the labels are predicted for the test set. These labels are used to evaluate how well the algorithm can be expected to perform on unlabeled data. This figure compactly shows the reason that validation is important. On the left side of the plot, we have very low-degree polynomial, which under-fits the data. This leads to a very high error for both the training set and the validation set. On the far right side of the plot, we have a very high degree polynomial, which over-fits the data. This can be seen in the fact that the training error is very low, while the validation error is very high. Plotted for comparison is the intrinsic error (this is the scatter artificially added to the data: click on the above image to see the source code). For this toy dataset, error = 1.0 is the best we can hope to attain. Choosing d=6 in this case gets us very close to the optimal error. 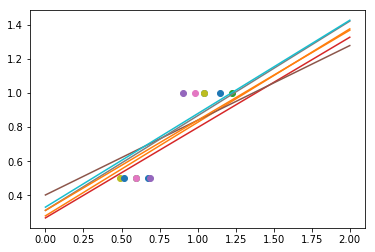 The astute reader will realize that something is amiss here: in the above plot, d = 6 gives the best results. But in the previous plot, we found that d = 6 vastly over-fits the data. What’s going on here? The difference is the number of training points used. In the previous example, there were only eight training points. In this example, we have 100. As a general rule of thumb, the more training points used, the more complicated model can be used. But how can you determine for a given model whether more training points will be helpful? A useful diagnostic for this are learning curves. A learning curve is a plot of the training and validation error as a function of the number of training points. Note that when we train on a small subset of the training data, the training error is computed using this subset, not the full training set. These plots can give a quantitative view into how beneficial it will be to add training samples. As the number of training samples are increased, what do you expect to see for the training error? For the validation error? Would you expect the training error to be higher or lower than the validation error? Would you ever expect this to change? 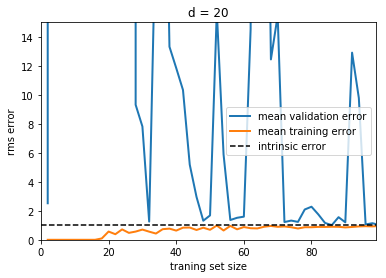 Notice that the validation error generally decreases with a growing training set, while the training error generally increases with a growing training set. From this we can infer that as the training size increases, they will converge to a single value. From the above discussion, we know that d = 1 is a high-bias estimator which under-fits the data. This is indicated by the fact that both the training and validation errors are very high. When confronted with this type of learning curve, we can expect that adding more training data will not help matters: both lines will converge to a relatively high error. When the learning curves have converged to a high error, we have a high bias model. Decrease regularlization in a regularized model. Here we show the learning curve for d = 20. From the above discussion, we know that d = 20 is a high-variance estimator which over-fits the data. This is indicated by the fact that the training error is much less than the validation error. 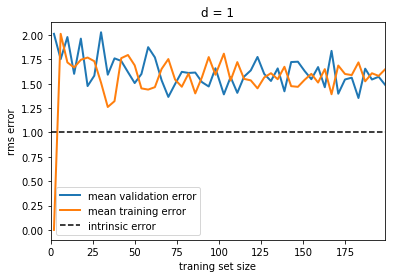 As we add more samples to this training set, the training error will continue to climb, while the cross-validation error will continue to decrease, until they meet in the middle. 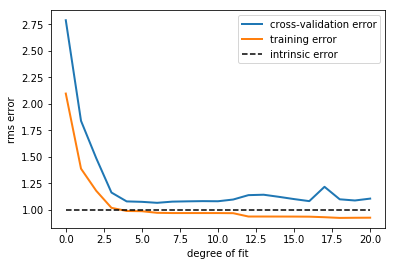 In this case, our intrinsic error was set to 1.0, and we can infer that adding more data will allow the estimator to very closely match the best possible cross-validation error. When the learning curves have not yet converged with our full training set, it indicates a high-variance, over-fit model. These choices become very important in real-world situations. For example, due to limited telescope time, astronomers must seek a balance between observing a large number of objects, and observing a large number of features for each object. Determining which is more important for a particular learning task can inform the observing strategy that the astronomer employs. 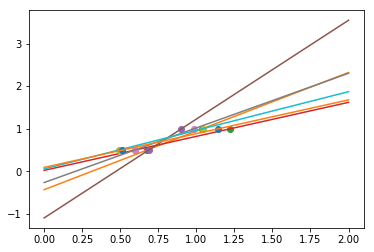 In a later exercise, we will explore the use of learning curves for the photometric redshift problem. This may seem excessive, and many machine learning practitioners ignore the need for a test set. But if your goal is to predict the error of a model on unknown data, using a test set is vital.